From a public health perspective, there are still far too many road victims due to collisions that are mostly preventable: 704 deaths and 6,397 serious injuries, according to the SAAQ (2005). Their road safety statistics covering the five years from 2000 to 2005 show a general upward trend in Quebec. Indeed, the number of victims killed rose by more than 9% between 2004 and 2005, and serious injuries rose by 14.2%. In the hospital network, this represents an average of more than 4,000 hospitalizations per year (INSPQ, 2006). The significant gains achieved over the last twenty years are mainly due to programs aimed at reducing the incidence of driving while impaired by alcohol (DWI), entrenching the use of seatbelts, and encouraging the construction of safer vehicles. However, several factors that have not been approached in the same way are currently reducing road safety in Quebec. Generalized disregard for the legal speed limit on the entire road network as well as driving while impaired by alcohol (DWI) can partly explain the stagnation, if not the worsening, of statistics. Included among these problems is the proliferation of in-vehicle sources of distraction; among these is the cell phone. Quebec has not escaped the global phenomenon of the cell phone craze. In Canada, the number of subscribers to wireless telecommunications services went from 6,000 to 17,000,000 between 1985 and 2005. Recent surveys report that more than 50% of Quebeckers who own a cell phone use it while driving, the equivalent of one driver in four. 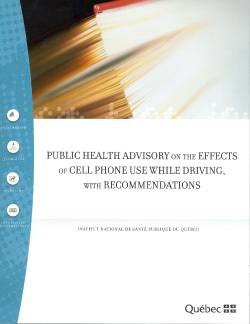 This advisory examines this behaviour and answers the following question: Does cell phone use while driving increase the risk of traffic collision and personal injury? Do “hand-held” and “hands-free” devices have the same effects on performance and collision risk? Does practice have an impact upon risk? Should cell phone use while driving be banned and what effective measures can be taken to eliminate this risk? To answer these questions, we systematically reviewed the scientific literature on the subject. Databases, web pages and road safety experts were consulted as part of our effort to locate and select studies and documents deemed relevant. Our overall conclusions are based on the application of strict review criteria to relatively homogenous populations of studies. The convergence of results from studies using a variety of methodologies and different data sources makes it possible to determine with increased validity the risk generated by this on-road behaviour (Simpson, 2005). Analyses of the literature have made it possible to establish the impact of cell phones on driving performance, on-road behaviour and the risk of collision. The respective effects of hand-held and hands-free devices have also been established. And finally, the results of measures that have been taken to limit the risk associated with cell phone use while driving have been analyzed.